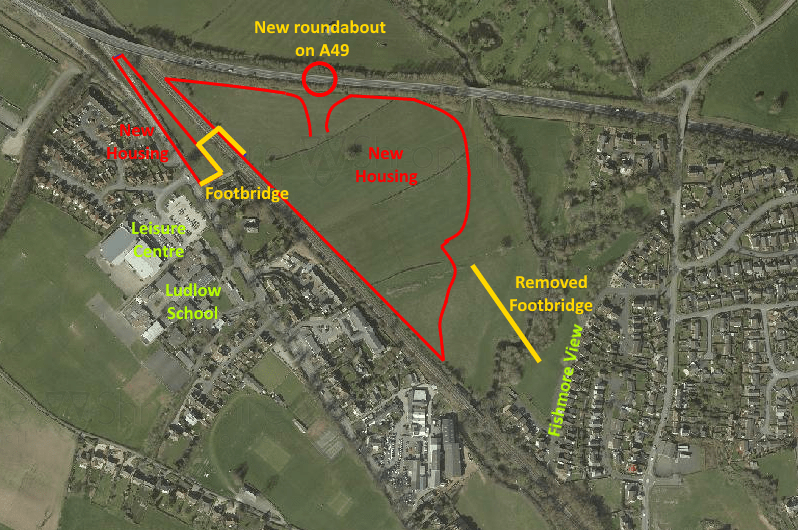 Tesni, the company that is planning to build 215 houses between Bromfield Road and the A49 has successfully applied to remove the controversial foot and cycle bridge across the Corve to Fishmore View. This huge footbridge would have been more than 250 metres long (275 yards) and soar 7 metres (23 feet) above the bed of the Corve. This action follows my request on behalf of Fishmore View residents. They were concerned that their quiet cul de sac would become clogged with parked cars owned by dog walkers using the proposed riverside park the other side of the Corve. Now they can relax. The footbridge has been removed from the plans and will not be built. In November 2015, a planning inspector approved plans for 215 homes off Bromfield Road and the A49. The South Planning Committee had previously rejected the scheme twice but the arguments the committee members were not strong. Shropshire Council decided not to present evidence in defence of the committee decision at the planning inquiry. The developer, Tesni, was more than happy to remove the Fishmore View footbridge from the plans. It offered to do so before the plans went to the South Planning Committee but the committee threw the entire scheme out. When it came to the planning inquiry, Tesni’s legal team decided to fight for the planning application as a whole, including the footbridge. I was a lone voice arguing that the bridge should not be given planning consent. But the planning inspector was unsympathetic to local arguments and approved the footbridge anyway. The applicant has submitted this application in response to a request from Councillor Boddington on behalf of local residents, so as to provide the Council with the opportunity to review the need for the river crossing and to delete reference to it in response to community objection, if it so wishes. Fortunately, the council decided that the footbridge is not needed. It has not yet given its reasons, but both council planners and the developer tell me that removal of the footbridge has been approved. I am very pleased that the community’s voice has been listened to. The Tesni site is currently up for sale, so it may be a little while before we see the final plans for the site which at present has outline planning permission.